This volume, the first to specifically address the function of psychologists as practitioners and scientists in medical settings, presents a range of approaches to assessment and diagnostic practice rather than a litany of specific tools, diseases, or diagnostic problems. The comprehensive discussion, augmented by 41 case studies, addresses the psychological assessment of patients and their families using traditional neuropsychological and psychological diagnostic tools in various topic areas and settings. The application of assessment to issues such as ethics and law, professional self-assessment and credentialling, and the communication of diagnostic findings is also discussed. Illustrations note XIV, 324 p.
Fundamentals of Assessment: Psychologists in Medical Settings: Contributions to a Comprehensive Understanding of the Patient. Referral Logistics and Communication. General Clinical Considerations; M. Caserta. Assessment at the Medical-Surgical-Psychological Interface: Psychosomatics and Somatoform Disorders. Adjustment Disorders Related to Illness and Psychological Disorders Contributing to Medical Illness. Assessment Prior to Stressful or Invasive Medical Procedures and Presurgery Assessment. 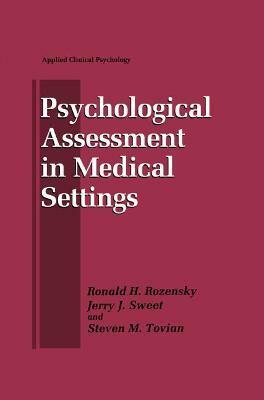 Assessment of Families and Children: The Assessment of Families in Medical Settings; L. Feldman Honor. Psychological Assessment in Pediatrics. Traditional Assessment: Neuropsychological Assessment in Rehabilitation. Neurology, and Psychiatry. Utility of Traditional Psychological Assessments; R.V. Prescott. Special Clinical Assessment Areas: Emergency Room Assessment: Suicide, Violence, PTSD, and Acute Anxiety; J.M. Dod. Special Assessment Issues in the Hospital System: Ethical Dilemmas and Legal Issues from a Psychosocial Perspective; S. Kraft. 3 Additional Chapters. Index.